CarGurus has 127 nationwide 4C listings starting at $42,900. Until a couple of years ago, Alfa Romeo was a fairly distant memory for us here in the United States. The venerable Alfa Spider quietly disappeared in the early 1990s while everybody was buying Mazda Miatas, and the 164 sedan was the last model to bow out of the U.S. market in 1995. A few dozen of the exotic 8C Competiziones did make their way to this side of the Atlantic, but that was almost 10 years ago. Alfa Romeo was gone, but enthusiasm for the brand in America didn’t disappear, and we’d been teased with a proper return for several years before the 4C finally came along in 2014. And in true Alfa Romeo fashion, it offers tons of performance and clever engineering in a small, relatively affordable package. While it certainly isn’t cheap at 60 to 70 grand, the 4C is just about the most exotic automobile you can buy for five figures, and it both looks and sounds like a car that costs a lot more. Available as a coupe or a spider, the 4C has a full carbon fiber monocoque chassis and body and is noted for its light weight, razor-sharp handling, ample power from its 4-cylinder turbo, and characteristically (but also charmingly) poor supercar ergonomics. The 4C is a very new design as well as a low-volume product with a short options list, so changes for 2017 are minimal. Sitting behind the driver is the heart of the 4C: an all-aluminum turbocharged 1.75-liter 4-cylinder engine that’s good for 237 hp and 258 lb-ft of torque—plenty for a car that weighs less than 2,400 pounds. The 4C is more about handling than speeding between the lights, but it will nevertheless get from 0 to 60 mph in just 4.5 seconds. An Akrapovic dual-mode exhaust system with centrally mounted tips is optional and sounds phenomenal, but even the stock system will turn heads, as it combines a raw, deep burble with a wail from the turbocharger and occasional snorts from the tailpipes when you change gears. The 4C also gets an estimated 24 mpg city/34 highway/28 combined, which is much better than many midengine sports cars. The fuel tank holds only 10.5 gallons, but the 4C can’t carry enough stuff for a long trip, anyway. The 4C is low, light, and short. It weighs 800 pounds less than a Chevrolet Corvette and 1,000 less than a Jaguar F-Type. The suspension uses MacPherson struts in the back and double wishbones up front, and many components are made of lightweight aluminum. An available Track package, meanwhile, includes stiffer shocks and anti-roll bars. The wheels are staggered, with standard Pirelli P Zero 205/45ZR17s up front and 235/40ZR18s in back. With the carbon and leather trim on the inside as well as a flat-bottom steering wheel, the 4C looks like serious business, and it is—but despite its fairly raw nature, this car is unfortunately available only with paddle shifters. They may get you around a track faster, but many true driving enthusiasts would prefer to do the work of changing gears themselves—and how cool would a 4C with a shiny aluminum open-gate shifter be? Even so, the 6-speed dual-clutch paddle-shifted transmission reportedly works very well, especially in Race mode. It should come as no surprise that the 4C is not at all a practical automobile. The seats don’t adjust by much, it’s hard to get in and out of, its rear visibility is predictably terrible, and other than a small compartment behind the engine that will fit little more than your gym bag, there is no real storage space. And with the Spider, the fabric top has to fit in the trunk while dropped, leaving you with basically no storage space at all. The cabin isn’t the fanciest or most premium-feeling space, but it certainly does look the part with red stitching, deep bolstered seats, carbon fiber trim, and the nifty flat-bottom steering wheel with the classic Alfa Romeo crest displayed prominently in the middle. The gauges are centered in a 7.0-inch LCD display screen that changes color depending on the car’s driving mode. Dynamic mode changes the screen to red, Natural to gray, All-weather to blue, and Race to bright yellow. Standard audio comes from an Alpine stereo, but the exhaust on this car will be more engaging than anything coming out of the speakers. The 4C comes standard with air conditioning, power windows, and a USB jack, but further interior options include all-leather upholstery, cruise control, an alarm, and rear parking assist, a welcome addition given the car’s poor visibility and wide turning circle. While the cockpit looks racy enough in standard form, an additional Carbon Fiber Trim package adds carbon fiber to the vents, the rim of the instrument cluster, and the shifter bezels. Safety obviously wasn’t a concern in the design of the Alfa 4C, and it doesn’t have much in the way of features other than what’s required by law. The car also hasn’t been crash tested, like most upmarket cars. But an accident isn’t likely, as this is the kind of car that won’t cover very many miles and will typically be on the road during nice weather, away from everyday traffic. If you want the absolute most performance per dollar, a Corvette is probably still the best choice in this price range, and a Porsche Cayman is another tempting and sensible alternative. U.S. sales have so far amounted to a few hundred 4C Coupes and Spiders, while equivalent Jaguars, Porsches, and Corvettes number well into the thousands. For a car with a sense of occasion that looks and sounds like a million bucks, though, the 2017 Alfa Romeo 4C is hard to ignore. And while some of its more established competitors offer more comfort, convenience, and probably reliability, the 4C offers exclusivity—which does matter to a lot of people. It’s an instant classic, the kind of car that will be a must-have for collectors 30 years from now. What's your take on the 2017 Alfa Romeo 4C? Jaguar_Master Simply the best money spent for a very unique and limited make street legal race car. 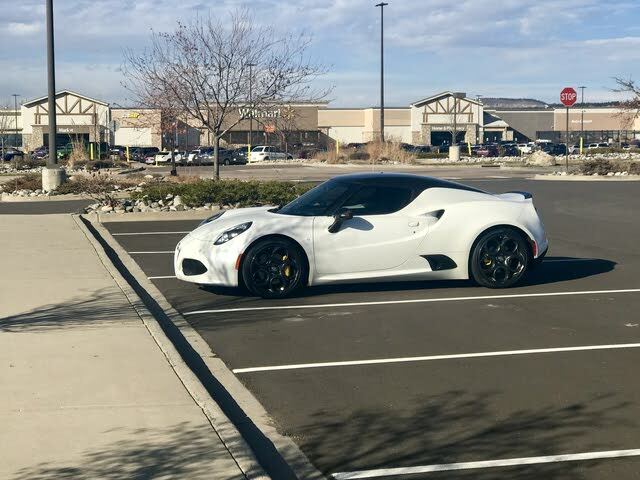 Have you driven a 2017 Alfa Romeo 4C?